Yesterday the most famous hockey player of all-time, Wayne Gretzky, announced he was stepping down as head coach of the Phoenix Coyotes. 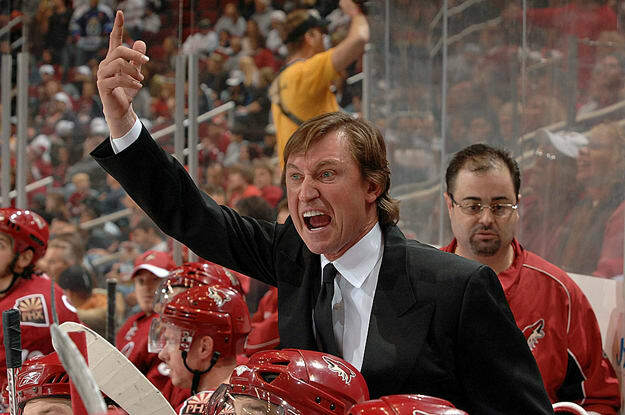 The Great One led the Coyotes (and was also its co-owner) for four years, compiling a decidedly less-than-great 143-161-24 record while watching attendance and profits plummet. • After 16 seasons, five NFL champsionships and two Super Bowl MVPs as quarterback of the Packers, Bart Starr became head coach in Green Bay in 1975, and promptly drove the team into the ground (probably because he didn&apos;t have Bart Starr playing quarterback for him). In nine seasons as coach, he went 52-76, including four campaigns in which the Pack lost 10-plus games. His only playoff appearance occurred during the strike-shortened 1982 season (when over half the league made the postseason). • Twenty-two years after leading Argentina to the World Cup as a player, the always-controversial Maradona was hired to coach the national side last fall. So far, so bad—with only two matches left to qualify for 2010 South Africa, Maradona has watched his Argentinian side plummet to fifth place in the South America standings. With only the top four countries guaranteed spots, Argentina is embarrassingly close to missing the tournament altogether, which would be akin to the U.S. men&apos;s basketball team failing to qualify for the Olympics. After a life full of crises ranging from stomach-stapling surgery to cocaine addiction, failing to lead Argentina to the World Cup would easily be Maradona&apos;s biggest calamity yet. • &apos;80s babies might not know, but in his hey, Zeke was one of the most feared ballers on the planet: a 12-time All Star, a Finals MVP, and the record holder for most points (25) scored in a quarter in a Finals game. But as a coach? Not so much. Three years early in the Aughts with the Pacers brought three playoff appearances—and three first round exits. Two years with the Knicks brought a 56-108 record, an $11.6 million sexual harassment suit, and enough general fuckery to keep New York tabloids in full pun mode for days. • During his playing career, Williams was considered the best pure hitter in baseball, and the numbers back up the claim: in 19 seasons (he lost five to military service in WWII and the Korean War), the Splendid Splinter hit .344, with 521 homers and nearly three times as many walks as strikeouts (he is also the last player to hit over .400 in a season). In a four-year stint managing the Washington Senators (relocated to Texas for his final season), Williams compiled a 273-364 record, including a 100-loss campaign in his final year. • One of the most intense players in tennis history, Connors took home eight Grand Slam titles including a record (since tied) five U.S. Opens. In 2006, Andy Roddick, another intense American, hired Connors to be his coach. Although Roddick reached the U.S. Open final in the first year of their partnership, the pair proved to be a mismatch, as Roddick failed to make another Grand Slam final until after he fired Connors in &apos;08.